Tanna of the third generation (second century); junior contemporary of Eleazar of Modi'im (Tosef., Sanh. iv. 8; Yer. Meg. i. 71c) and of Jose the Galilean (Mek., Yitro, Baḥodesh, 2). He lived through the period when, according to a younger contemporary, the performance of circumcision was punished by the Romans with the sword; the study of the Jewish law, with the stake; the celebration of Passover, with crucifixion; and the observance of the Feast of Booths, with the scourge (Mek. l.c. 6; Lev. R. xxxii. 1). Still, Eleazar faithfully adhered to the teachings of his religion. Once he was arrested and cast into prison, where he met Hananiah ben Teradion. He tried to instil hope into his fellow prisoner's breast, because there was only one charge against him, that of teaching the Law, while himself he considered lost, because there were five counts against him. Hananiah, on the contrary, thought that Eleazar's chances of escape were better than his own; and the sequel proved that he was right. Hananiah was condemned to a terrible death, while Eleazar was acquitted ('Ab. Zarah 17b). 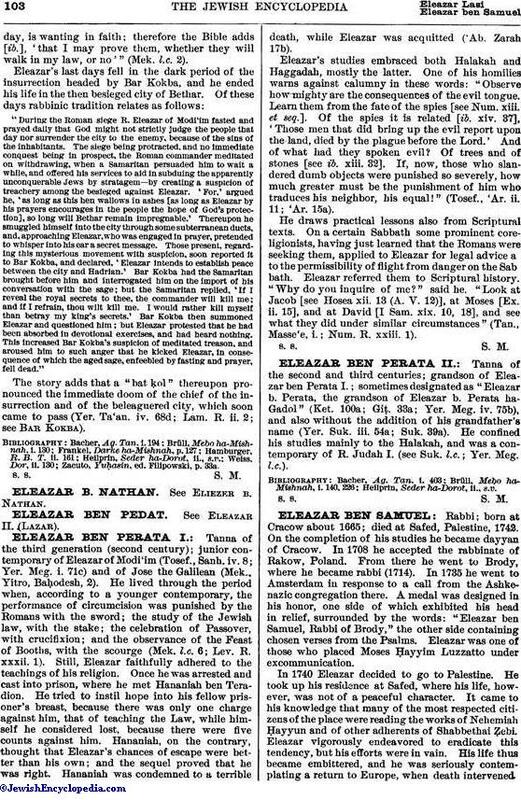 Eleazar's studies embraced both Halakah and Haggadah, mostly the latter. One of his homilies warns against calumny in these words: "Observe how mighty are the consequences of the evil tongue. Learn them from the fate of the spies [see Num. xiii. et seq.]. Of the spies it is related [ib. xiv. 37], 'Those men that did bring up the evil report upon the land, died by the plague before the Lord.' And of what had they spoken evil? Of trees and of stones [see ib. xiii. 32]. If, now, those who slandered dumb objects were punished so severely, how much greater must be the punishment of him who traduces his neighbor, his equal!" (Tosef., 'Ar. ii. 11; 'Ar. 15a). He draws practical lessons also from Scriptural texts. On a certain Sabbath some prominent coreligionists, having just learned that the Romans were seeking them, applied to Eleazar for legal advice a to the permissibility of flight from danger on the Sab bath. Eleazar referred them to Scriptural history. "Why do you inquire of me?" said he. "Look at Jacob [see Hosea xii. 13 (A. V. 12)], at Moses [Ex. ii. 15], and at David [I Sam. xix. 10, 18], and see what they did under similar circumstances" (Tan., Masse'e, i.; Num. R. xxiii. 1).